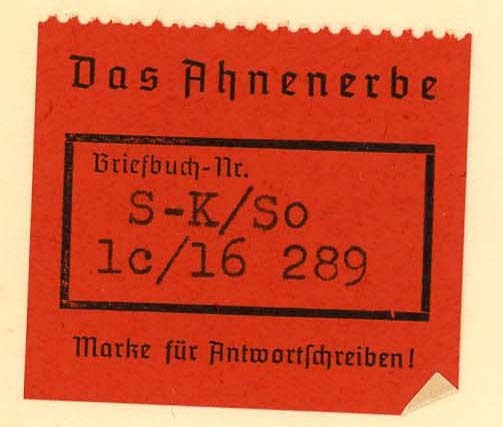 The Ahnenerbe was a branch of the SS founded by Heinrich Himmler in 1935 to research ancient cultures and practices in support of efforts to establish a coherent and superior Aryan culture which would be adopted by the Third Reich after the war. The documents in this collection likely originate from Wolfram Sievers' personal papers. Sievers was the managing director of the Ahnenerbe and was later tried and executed for his role in overseeing the institute's involvement in medical experiments on prisoners. The documents were discovered by student researchers in 2009 amongst the Pennsylvania Folklife Society collection. It is theorized that Alfred L. Shoemaker, who gathered the bulk of the materials in this collection, acquired the documents during his service in Army intelligence during World War II. It is also possible that someone else acquired the documents and sent them to Shoemaker as he was an authoritative scholar on Pennsylvania German or "Dutch" culture. The documents in this collection continue to be translated and organized as time and resources permit.